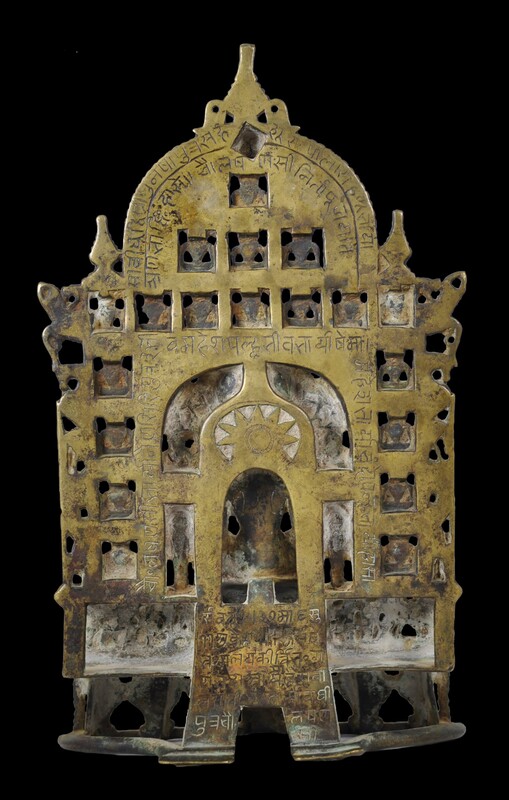 This good-sized bronze stela has many characteristics of a fifteenth century Jain bronze. 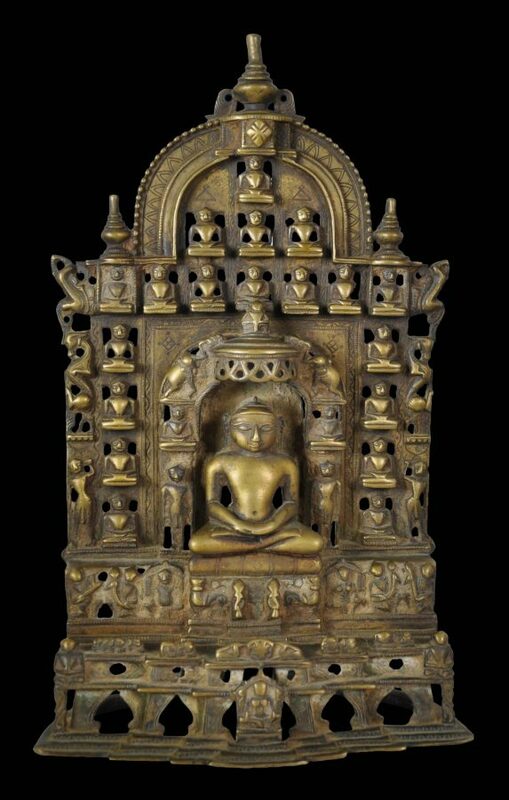 The principal Jina is seated on a gaja-simhansa or elephant-lion throne. Together with the pair of standing jinas and two sitting jinas the central figure forms a ‘five jina image’ or a pancatirthi. But with the additional jinas which are arrayed around the pancatirthi in an arch, the overall stela is a ’24 Jina image’ or a caubis-jina-pata. Other figures are attendants and celestial nymphs, some of which are seated, others stand and some yield fly whisks. The nine planets (navagraha) are represented on the plinth in two sets of two groups – five are on one side and four are on the other. Are pair of footprints have been engraved into the lower part of the platform – an unusual and pleasing touch perhaps meant to represent the donor or the commissioner of this piece. 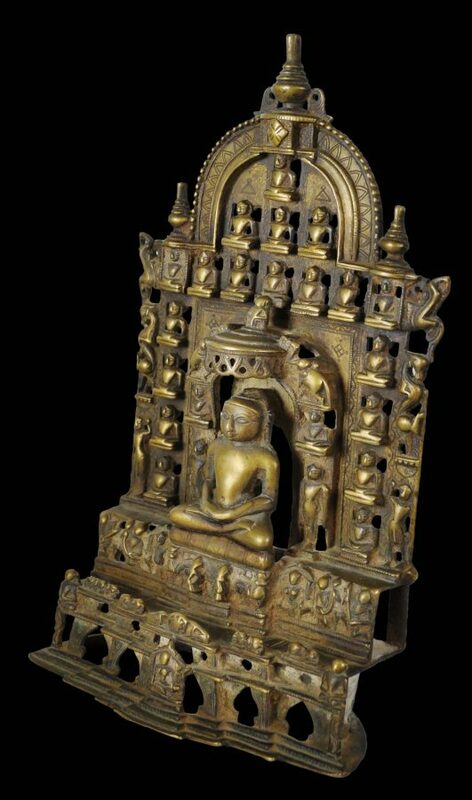 Rising above the central Jina is a triple parasol from which is suspended a pierced, pendant border, and on top of which sits a celestial drummer whose features have been worn smooth with puja wear. The ornamental arch which rises over the whole ensemble is topped by a narrow necked vase or kalasha. A small figure of Shantidevi is to be found at the centre of the base. Above Shantidevi’s head is a cakra wheel. The reverse is engraved with a lengthy inscription in a form of Devanagari script.